Ottawa International Animation Festival has a glorious 41 year old record of attracting art lovers and film-makers around the world. OIAF has been hosting film competition featuring the most interesting and original animated features from around the world. The festival celebrates the latest technology in animation at the same time honouring the tradional animation as well. The filmmakers were provided with a distinct venue to show their films, discuss issues, and meet other young filmmakers, animation educators, and industry representatives. 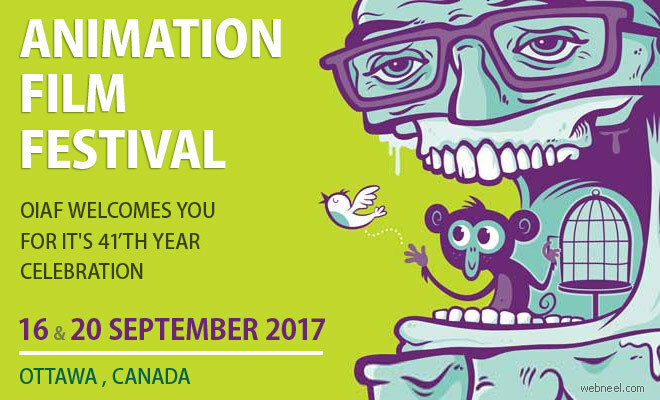 ABOUT OIAF : From September 20-24, 2017 downtown Ottawa will once again be the stage where you can enjoy the world's most cutting-edge, thoughtful, funny and provocative animation films while mingling with many of animation's most celebrated stars, studios and characters. Whether you love classic cartoons, mind-bending experiments, fantastic digital creations, dazzling effects, technical fireworks, thought provoking observations, or pure gut-busting fun, there is something for everyone and anyone at the Ottawa International Animation Festival (OlAF). For 41 years, the OlAF has attracted film and animation buffs, art lovers and filmmakers from around the globe. You won't want to miss this year's exciting line-up of screenings, workshops, panels and parties taking place at the ByTowne Cinema, National Gallery of Canada, Arts Court, Saint Brigid's Centre for the Arts, and the Chateau Laurier. A sneak peek screening of Nora Twomey’s new feature The Breadwinner. Synesthetic Pub Crawl, hosted by Estonian filmmaker and beer connoisseur Priit Tender. Multiple tribute screenings for the French animation studio Folimage founded by Jacques-Rémy Girerd, which has made shorts and features for the last 36 years. A presentation by Pixar director Dave Mullins about the process of Pixar’s new short Lou from initial pitch. Two retrospective screenings and a discussion with independent filmmaker Bob Sabiston, the animation director of Waking Life and A Scanner Darkly, both of which used his custom software Rotoshop. A workshop from Giphy staffers that explains why GIFs are a good way to get your animation ideas. A tribute screening to Evelyn Lambart (1914-1999), the key creative collaborator of experimental animation legend Norman McLaren and a pioneering Canadian woman animator. With an emphasis on edgy and independent, the OIAF programming team picks the most interesting, original animated features from around the world to screen in the competition. Join us for the Gala screening with the jury. The filmmakers are often in attendance! SHORT FILM COMPETITIONS: The Official Competition section of the Festival consists of works selected by the programming team from 1992 entries. These short works are programmed into eight different screenings that feature something for everyone. Join us for each programme's Gala presentation with the jury and many of the filmmakers in attendance. PANORAMA SCREENINGS : Check out these collections featuring some outstanding, new animated work from across Canada and around the world. RETROSPECTIVES AND SPECIAL SCREENINGS : We've brought to together some special animated programs specially curated for the OIAF 2017. VR @ OIAF : Put a headset on and immerse yourself in some highly creative VR experiences!